Hi i made a tuto young video to install the dual boot on the pipo x7 android 5.1.1 and windows 10 it is the phoenixos version. Last edited by mianbuba; 12-30-2016, 07:20. Hi everyone. Any current x7s owners able to get HDMI audio working in android? Works fine to my LG tv when in windows but no audio in KitKat. I wouldnt count on it. I even opened a claim with paypal and had the paypal people communicate to them that the playstore wasnt working and they just decided to refund me my $. Seems like some shady stuff going on here. Im hoping someone could help are point me to someone who can. Im from the US and ive tried to skype with Pipo but no luck - sent a few emails... no response. 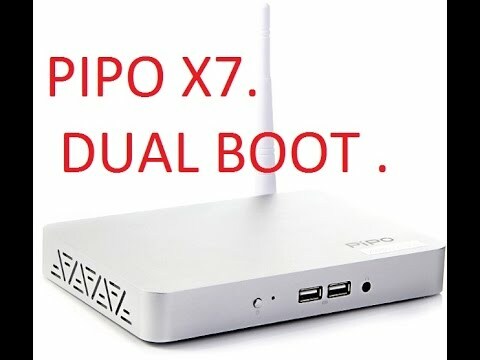 I have 2 Pipo x7s from geekbuying.com and 1 is completely bricked (I think) I had them both all set up... apps and all. I think it was looking at the bios that did it. It wont turn on the only thing that happens is that the red light comes on - that's it. Cant boot into bios my usb sticks wont light so i cant boot from those. microsd - nothing. Can anyone help me please? Ive only had it for less than a week! is there something I can do with the other Pipo x7s that can get this one going? Can you connect them to another computer? Im stumped and Pipo doesnt seem to want to help. I guess i need to try geekbuying.com also. No clue how to install (yet). From PIPO i only got the Gapps (which you can't install due to no root). You can try to google how to root. "X98 toolbox". Thats how I managed to root my Teclast X80h tablet based on Baytrail cpu. Hope that helps. Nope, no luck here. Seems to be about the same script that i did try before. You need to get a 0 after a few commands but it won't. For current X7 owners like myself, I can only hope that someone take the X7s Android firmware and made it able to boot from USB. That will be the best case scenario. Even with only Windows install, the avail storage memory is appalling.. I think "U disk" means any kind of USB storage device. At the doc (http://www.mediafire.com/view/g85d84...ade_Method.doc) they use a SanDisk USB pen. What I don't understand, is it the win8 only (seems so), or also the android (doesn't seems so), and why do you have to (start) install the win from running Android???? All times are GMT-8. This page was generated at 16:28.